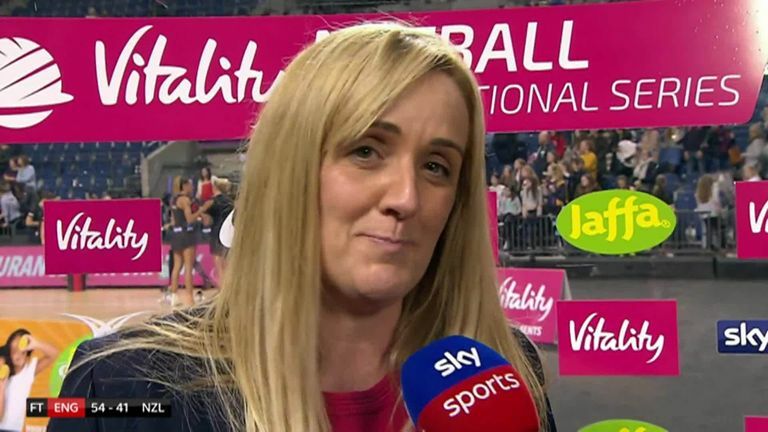 Tracey Neville's England Vitality Roses started 2019 as they mean to go on with a 54-41 victory over New Zealand in the opening round of the Netball Quad Series. 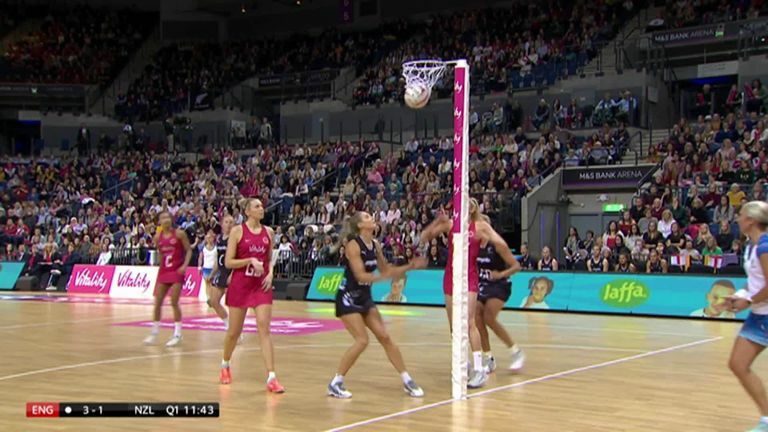 At the M&S Bank Arena Liverpool, the venue for the 2019 Netball World Cup in July, the Roses and Silver Ferns were second onto court after South Africa and Australia opened proceedings earlier in the day. With the summer's World Cup top of mind for all, results and performances in this Quad Series will have greater significance than ever before. It's the last time that every side will compete against the other before July. If lessons are to be learned then they'll need to be learnt now. After these two matches, the quartet of sides now have a week to recover and get back on the training court. The second and third rounds will be played back-to-back on Saturday January 19 and Sunday January 20 live on Sky Sports. The Vitality Roses made it four victories in a row against the Silver Ferns as they started their quest for a first Quad Series title off on a winning note. The 13-goal victory matches the Roses' best result against New Zealand however head coach Neville gave a measured assessment after the full-time whistle. "They came out and really challenged us and to be honest they exposed some weaknesses in parts of that game," said the head coach. "We implemented the game plan really, really well. We said about churning it out and I think we did that very well in that third quarter." The first 30 minutes saw both sides wrestle for supremacy with neither finding the right key to fully unlock a substantial lead. As a result, England held a single-goal advantage after the opening quarter, 13-12, and again at the end of the second 25-24. The match's tipping point arrived after the interval as the Roses showed their defensive prowess to gain the turnovers required for the dynamic duo of Helen Housby and Jo Harten to finish with a flourish. A run of five unanswered goals pushed England into a 31-26 lead and although the Silver Ferns closed that gap to four, that was a close as they would get in the quarter. Instead, the Roses were roared on by the crowd and finished with a ten-goal advantage - 40-30 - at three-quarter time. In the fourth, the Silver Ferns again chipped away at their host's lead and narrowed it back to 44-36. However, Karin Burger being sent off the court for two minutes (a result of repeated infringements after a warning) handed England a fresh window of opportunity with seven minutes to go. With the player-advantage, the Roses plumped their cushion to a healthy 11 goals. Whilst New Zealand had made personnel changes during the encounter, notably handing first caps to Kimiora Poi at Centre and to defender Erena Mikaere, Roses head coach Neville had resisted the urge to tinker with her playing personnel. Instead, movement arrived with just four minutes remaining as Natalie Haythornthwaite came on GA and Housby enjoyed a well-earned breather. Overall the change did little to disrupt the Roses' attack in the latter stages. While Geva Mentor and player of the match Eboni Usoro-Brown continued their tireless pressure and work on the Silver Ferns' shooters in the defensive end. The first match of the day saw the defending champions pushed hard by South Africa before they found their combinations and opened up in the latter stages. The full-time scoreline belied South Africa's work as they enjoyed a stronger first-half than Lisa Alexander's Diamonds, who had lost captain Caitlin Bassett to an injury in the build-up. South Africa were clinical in both defence and attack early on, Erin Burger's return made a significant impact for them while Karla Pretorius and Phumza Maweni were relentless in defence. In contrast, the Diamonds looked disjointed and a step off where they'd have liked to have been or needed to be. In the final minutes before half-time, the Diamonds wrestled themselves back into a 27-25 lead, having been five-goals down at one point, and ultimately went from there. Half-time changes for Australia helped them to find the greater level of fluidity they were searching for. Liz Watson moved from WA to C, Kelsey Browne arrived at WA and Steph Wood joined Gretel Tippett in the shooting circle. A potent period in the final five minutes of the third saw Australia press out to a seven-goal advantage as South Africa were disrupted when captain Bongiwe Msomi had to go off court due to a blood injury. With the match set at 43-38 with 15 minutes remaining, the Diamonds put their foot further on the accelerator while Norma Plummer's South Africa just didn't quite have the firepower to match their rivals for the full 60 and the scoreline ran away from them.